Looking to spruce up your restaurant’s patio this upcoming summer season? Check out our brand new outdoor collections! From tables, chairs, bar stools, and bases, we’re stocking your patio with pieces to spice up your outdoor area. In addition to the 20 colors we already offer, we’re adding four new poly lumber options to our lineup. We now have Powder Blue as part of our traditional poly lumber colors with a smooth texture. Driftwood Gray, Birchwood, and Antique Mahogany make their mark as our first wood grain poly options. Both selections carry color throughout their slats, making noticeable nicks a thing of the past. All of our poly lumber is very simple to clean and maintain with soap and water. These new colors can be used in our Caribbean, Adirondack, Great Lakes, Shipyard, Outer Banks, and Outdoor Communal Table collections. Our most colorful outdoor collection yet! The Caribbean Collection is bringing color and style to your restaurant’s patio. Select a black or silver lightweight frame to complement your choice of poly lumber slats. From beachy colors like Aruba Blue (pictured) and Bright Orange to a more neutral palette with Weather Wood or Birchwood, there are 21 smooth and 3 textured poly options. With so many chairs, tables, and bar stools to choose from, the combinations are endless as to what you could come up with. As with all of our poly lumber products, this collection is warrantied for outdoor use, won’t fade, and are simple to clean.Our Caribbean collection is just what you need to brighten up your restaurant’s outdoor area. No matter what table top you plan on using, the Palermo base can support it! This base can be used indoors or outdoors. We’ve thought ahead to the risky environment that outdoor furniture endures. To prevent rust and corrosion in the harsh exterior elements, the Palermo is constructed with a steel plate wrapped in aluminum with an aluminum column. These durable outdoor materials give your outdoor tables the sturdy foundation and protection they need. Whatever size your table, the Palermo comes in both single and double sizes. Offered in a silver finish or a black powder coat, the Palermo is easy to match your outdoor furniture. Pair an umbrella with this base and create a shady spot for your patio guests. If you’re trying to create a community atmosphere on outdoor patio area, the Outdoor Communal Table with Four Legs is perfect for your restaurant. When it comes to its silhouette, this table stands out among the crowd. Instead of a top and base combination, the Outdoor Communal Table stands tall on four legs, reducing the chance it will move because of the weather. 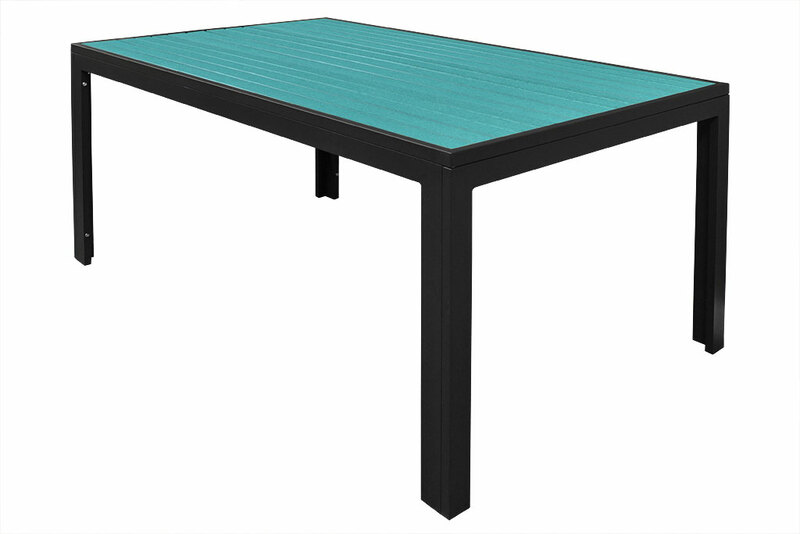 The Outdoor Communal Table can have a black powder coated frame, depending on what other furniture you’re trying to match. 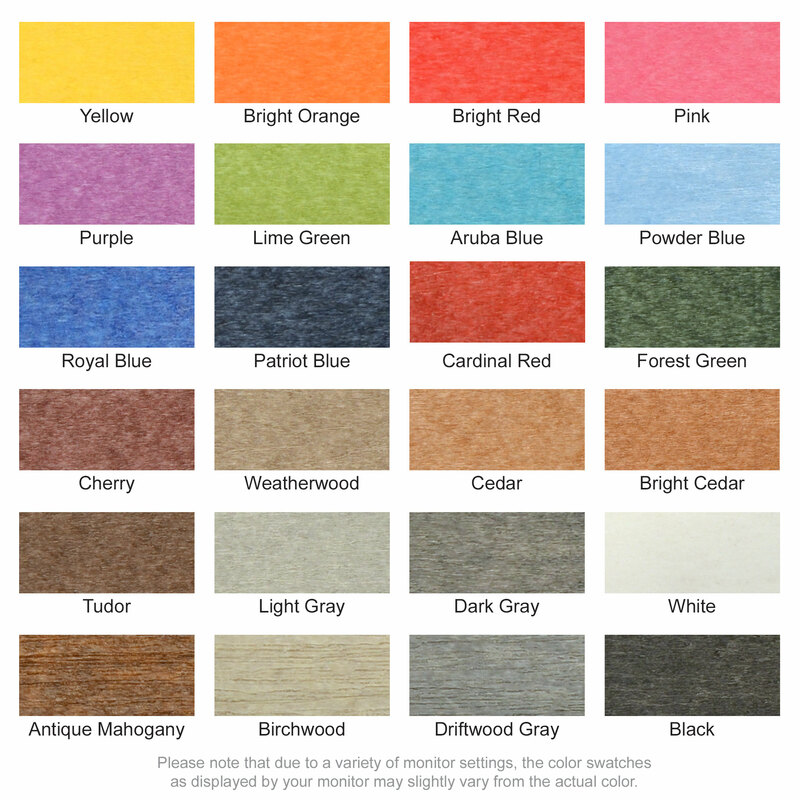 Make coordinating your furniture a cinch; our poly color selection is the same throughout all our products. For more information, check out our site, call our sales department (1-800-986-5352), or check out last year’s collections for even more inspiration.